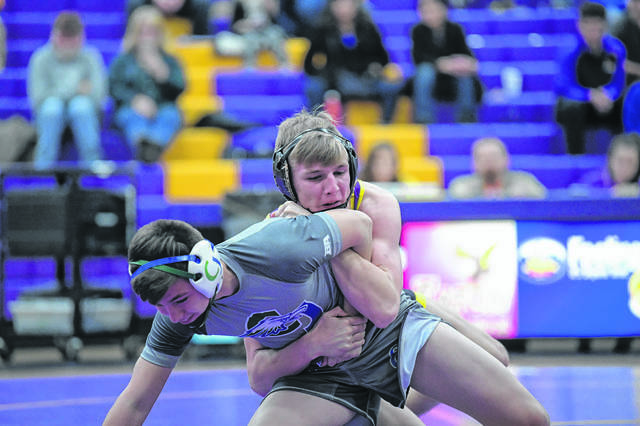 Eaton’s Wade Monebrake will bring a 24-2 record into the tournament and will be considered one of the favorites in the 145-pound weight division. EATON — Twenty-three wrestling teams will travel to Eaton High School this weekend for the 49th Annual Eaton “Sam Ridder” Invitational, which begins on Friday. Eaton, coming of a trip to the Top Gun in Alliance where the Eagles placed 24th with 57 points, will look to improve on its fourth place finish from a year ago. Wrestling is scheduled to begin at 4:30 p.m. on Friday. Competition will begin at 10 a.m. on Saturday with the finals scheduled to take place 45-60 minutes after the conclusion of the consolation finals. Particiapting teams include Arcanum, Bellbrook, Carroll, Chaminade Julienne, Eaton, Edgewood, Franklin, Hamilton, Milton-Union, National Trail, Oakwood, Cincinnati Reading, Hamilton Ross, Springfield Shawnee, Stebbins, Talawanda, Thurgood Marshall, Twin Valley South, Valley View, Wayne, Waynesville, Westfall and Wilmington. All-session passes are $12. Cost for Friday only is $5; Saturday all-day session is $8; Saturday morning session only is $5. https://www.registerherald.com/wp-content/uploads/sites/41/2019/01/web1_ehswr13.jpgEaton’s Wade Monebrake will bring a 24-2 record into the tournament and will be considered one of the favorites in the 145-pound weight division.